Hawtan Leather products are available for order by the square foot in a wide pallet of colors, textures and thicknesses. 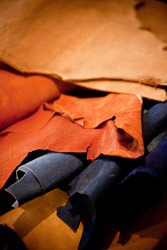 Custom leather production orders are available and are made to meet your specific leather manufacturing requirements. Please contact us to review which product is best suited for your company’s needs and to request a leather sample in any product category. Thank you for choosing Hawtan Leathers.